Which Type of Hamsters Make the Best Pets? Are you considering buying a hamster as a pet? Did you go to the pet store and peer into the many tanks of critters wondering which one of those fuzzy little things is right for you? Before you commit, read up a bit on each of the most commonly found hamsters at your local pet store to help you determine which is better suited for your home and family. These are the most commonly found and bought hamsters. When you think of a hamster, a teddy bear hamster is probably the kind you envision. Syrian hamsters, or Teddy Bear hamsters, are also known as black bear hamsters, golden hamsters or fancy hamsters, depending on their coloring. They are the biggest breed of hamster, which makes them a little chunky. 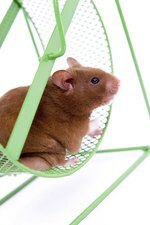 Teddy Bear hamsters are not as active as the smaller breeds. They usually mosey around the cage or curl up in a tube somewhere with fat, pellet-filled cheeks. Because they are bigger, they need a little more room. The plastic hamster cages you find at pet stores with the plastic tub add-ons are the best bet because they are often spacious and allow for lots of extra room to be added at a later time. These hamsters are good for the beginner hamster owner or for families with younger children. Because they are slow, they can be handled more often. The teddy bear hamsters do not bite as much, but because their teeth are bigger, a bite can leave a nice little nick to the finger. They live up to 2 or 3 years, and it should be cautioned that housing two of these little guys in the same cage, if not introduced young, could end messily, with death being a frequent outcome. Russian hamsters are much smaller than a teddy bear hamster and a little more pricey as well. The pros of a Russian hamster are that they are smaller, and they, too, come in a variety of colors, such as a variety of tans, spotted tans, grays, blues, albino and more. These guys are crafty, and they live to nibble and chew.A plastic cage or a cage with small spaces between the balls are optimal. The Russian Dwarf hamsters love to burrow and tunnel, so they need a little more bedding and lots of paper towel rolls to keep them busy. If they have more in their cage to nibble on, they will be less likely to want to nibble on you, or things around their cage. Russian Dwarf hamsters are fast. They love to run around in a plastic ball, but if the ball top comes lose, they aren't too quick to scurry away and can be caught again. Make sure they have a running wheel to exercise on as well! These hamsters would be best for either a beginner family who is cautious, or someone who has owned gerbils before, as the Dwarf hamster is just about as fast and nippy as a gerbil. They also live for about two to three years. Robo hamsters are definitely attractive. When you walk by these little guys in a pet store and see the way they ball up with their little cheeks bigger than they are, they remind you of those silly, big-eyed hamster cartoons. Robo hamsters are by far the smallest of their breed. They love to burrow and bury most of their food under their bedding. They are animated and high strung, and because of this, they move quickly. While they aren't prone to biting, they are hard to handle because of their speed alone. Robo hamsters love expending their energy on their running wheels and being let out to run in a plastic ball. Robo hamsters are best for the experienced hamster owner. They aren't ideal for younger children because they can't be held. So, unless your child is content with just watching them through the cage, another hamster might be more suitable.They also need to have plastic cages because they have a knack for squeezing between the bar cages and getting free. Like the others, Robo hamsters live about 2 to 3 years. Remember, only you will know what kind of hamster is good for you. There are other options available, so ask your local pet store employee about which little guy would be best suited in your home.